I used Emmy’s photo from Thursday’s post to create this Luna pic, cartoon effect then fantasy effect. My art ties in with The A-Z Blogging Challenge. Noel is posing with our G, a ghost. I tried to put a black frame around it and ended up with this. Enough leftovers for most of the week, and I even sent everyone home with some too. The decadent pie my niece made with a chocolate graham crust and chocolate chip cookie dough inside ( not actual dough, but tasty) topped with whipped cream and drizzed with chocolate syrup. Thankful our church does food blessing for Easter, here is a photo of some of the beautiful baskets people make. Ours is not included, we keep everything wrapped because we are germphobes. 5, Another vet free week. 6.The Great One usually teases me when I want a kiss goodbye, but today she came right over for a kiss. 8. I am thankful that I am more laid back than I used to be. My niece was so worried about The Great One breaking something and I just said, “she’d be doing me a favor, I have too many things anyway.” I remember crying over things my niece used to break like ears off of rabbit statues. 9. We got an inch of snow today- and it melted by the end of the day. 10.Hubby bought me a pineapple, I know that sounds odd, but I have been saying I wanted to get one and haven’t so when he went to get cat litter, he also got me a pineapple which was thoughtful. Hi everyone. Before we get started, we want to say goodbye to Mr. Buttons of Timmy the Tomcat’s family. He was only 7, but lost a battle with kidney disease. Please visit his family, if you haven’t already. 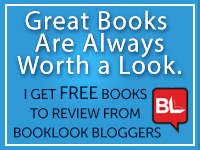 We are joining Athena’s Caturday Art Blog Hop and Ten Things of Thankful Blog Hops. For my art, I used Lunapic-cartoon and black and white effects on Emmy’s shopping cart photo. 1. Someone calling me Miss instead of the dreadful Ma’am. 3. Nice and Easy hair color- why pay for a full color every 6 weeks when I can spend $6 on this? 4. Pedicure with my mom. 5. Chinese food lunch with my mom after the pedicures- even if we looked odd in flip flops when it was only 30 degrees. 6. Breakfast with a friend. 7. A bargain- found 2 long sleeved v-necks for only $3/each. 8. Joanie sleeps between us every night, not the whole night, but she is always there in the morning. 9. The Babies R Us closest to me is closing , I am not happy they filed bankruptcy, but I am sick of people registering there for baby showers when they are so expensive. 10. A warm home, it sure has been a cold winter. Hi everyone! Phoebe thanks you all for the Gotcha Day wishes yesterday. 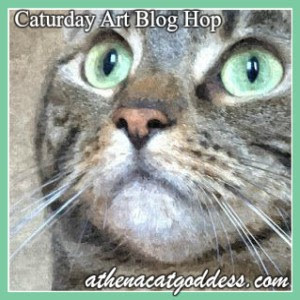 We are joining Athena’s Caturday Art Blog Hop. I used Lunapic’s VanGogh effect on Phoebe’s photo to create this work of art. 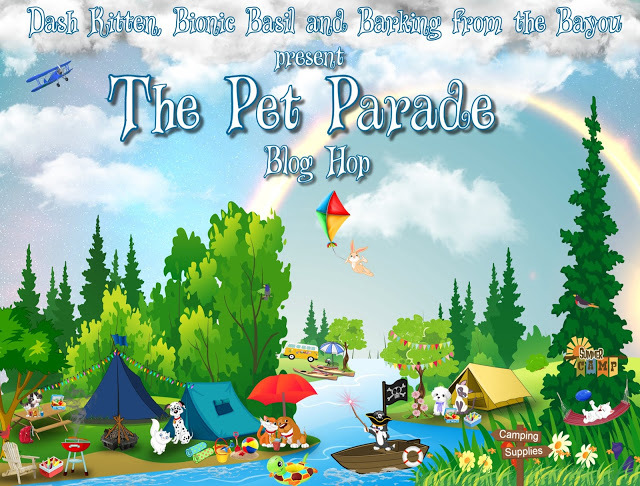 I am also joining Ten Things of Thankful’s Blog Hop too. And here are my 10 thankfuls for the week. I am thankful for the past 14 years with sweet Phoebe, she is truly the sweetest. I found big containers of Party Mix on clearance for $3.99 ( they are good until 2018). For calming collars- without them My Sammy would go after poor Brody constantly. The first blueberries of the season from the garden. I got to see my great-niece 3 days this week. My great-niece is picking up words faster by the day. My hubby is a wonderful cat Daddy and caters to Phoebe’s every whim including drinks from the sink at all hours of the night. My niece getting back from her business trip safely ( I worry when loved ones need to go on airplanes). To join in the thankful hop or to just see what others are thankful for click here.